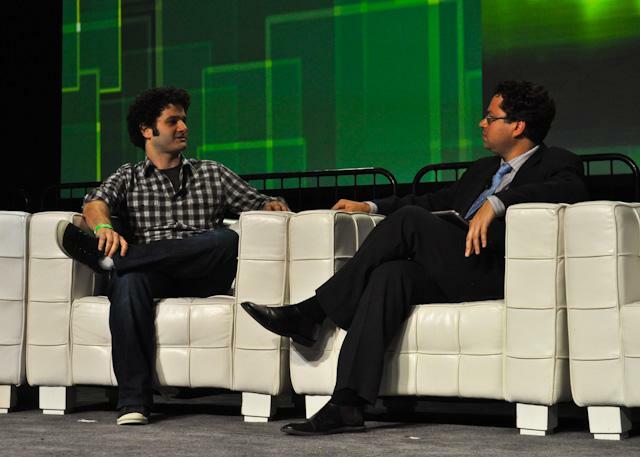 Dustin Moskovitz, co-founder of Facebook and, more recently, of enterprise collaboration software company Asana, spoke to TechCrunch Editor in Chief Erick Schonfeld at Disrupt this afternoon in a brief interview. The subject of their chat, for the most part, was the early days of Facebook and the changes the Valley has seen in the years since the company’s launch. Erick also asked Moskovitz for his thoughts on Google+. And in case you’re wondering, no, he doesn’t use it. To begin, Erick asked Moskovitz to talk about what Facebook was really like back in the early days. Unlike the movie, “The Social Network,” it wasn’t all parties, explained Moskovitz – in fact, there were only 2 to 3 parties in the first year. What the early founders of Facebook were really doing was putting in a lot of hours, he said. “We worked 14 to 16 hours days that year.” Building Facebook took a lot of time and effort. What this meant for Facebook was that, even in the early days, it didn’t have the luxury of trading on vanity metrics. Facebook needed to know exactly how many users were on the site, and for how long. During this initial period, Facebook was tracking metrics like user retention, specifically how many users were returning within 7 days or 30 days. They knew, for example, that people were sitting on practically dead MySpace accounts, said Moskovitz, so simply counting registered users wasn’t enough. In addition, there was this idea of total minutes spent on a site, an idea popularized by metrics-tracking services like ComScore. But while on the one hand, it was a good metric to know, on the other hand, it could mean that the site wasn’t as efficient as possible. Now Moskovitz is a part of a group casually known as the “Facebook Mafia,” a collection of early (now ex-) employees building new services, like he is with enterprise collaboration company Asana. Did any sort of Facebook ethos follow him and others into the founding of these companies, Erick wanted to know? “They’re really built to last, they’re adding massive impact to the world, and they really want to change the world for better,” said Moskovitz. In other words, they’re completely against the idea of building a company just to flip it back to Google. But do you use it?, Erick asked. Moskovitz says that if he had to fix Google+, he would add more symmetry to the relationships. There’s value in both one-way connections and two-way connections, he said, referring to the following model that Google+ uses, versus the friending model on Facebook. But Facebook does have a one-way model with its Pages, he added. And apparently, he believes that’s the model to beat. However, it was Moskovitz’s closing thoughts about how things in the Valley have changed over the years since Facebook’s launch that was, perhaps, the most profound. There’s been a fundamental shift in the culture here, he said. There are so many developers. There’s an idolization of entrepreneurship – something which “Mark and I played no small part in creating,” Moskovitz admits. There are even some developers who are raising money based on their reputation alone, he added. But when Facebook first arrived, there were only a handful of companies, so it was able to attract top engineers. “Now it feels like there are many smaller ideas being funded…companies with 3 to 10 people,” said Moskovitz. Would Facebook, if it started today, be able to find the talent it needed to execute on its ideas? That question, ironically posed at a conference that celebrates entrepreneurship and the very early stage startups which could draw the talent away from the so-called “big” ideas, was left unanswered.